I'm happy when the fit and visually like the look. Good looking, safety, clear ride!! This is a great looking helmet, the sunshade is not as dark as appears online. Without the ear covers, it is a little noisy obviously, but no more noisy than others. I love the ratchet fit as you can adjust without having to adjust the strap. After you get over the fact, that is never going to be as slim line as a non DOT half helmet, it is actually pretty cool looking. The only thing is, here it appears there is a neck curtain, and there isn't one, so a bit deceiving here. I fought between this one the Pit Boss. What I love is even the sunshade when pulled down, actually brightens up the day and the night, so the clear shade isn't needed as much. The beak really helps the wind. Most important, the helmet stays in place, so there is no stress on your neck nor head. It does run a bit small as others have stated. I am a large on every other helmet. I'm not a huge fan of the big LS2 on the front of the helmet, but oh well. I would purchase again. The gloss black is gorgeous. Got the 1812, looks awesome! Very happy with the helmet so far. As others have stated, size down. I wear a LG in almost every helmet, however I trusted others and went with a medium. Perfect fit! Thank you for all the informative reviews! Sunshield does not hit the bridge of my nose, and I do have enough clearance to wear my rx glasses underneath. This half helmet looks and fits very well. The vent on top did not seem to,make much of a difference open or closed as there is only the one vent and no air flow through. The built in Sun shade is awsome as well as the hook up for the electronics. All in all a good helmet. Built in dark sun visor only. You can take it out and replace it if you wanted. Yes, a clear shield is an option, you must asked at purchase. can you choose from a clear sun shade or does it automatically dark shaded? 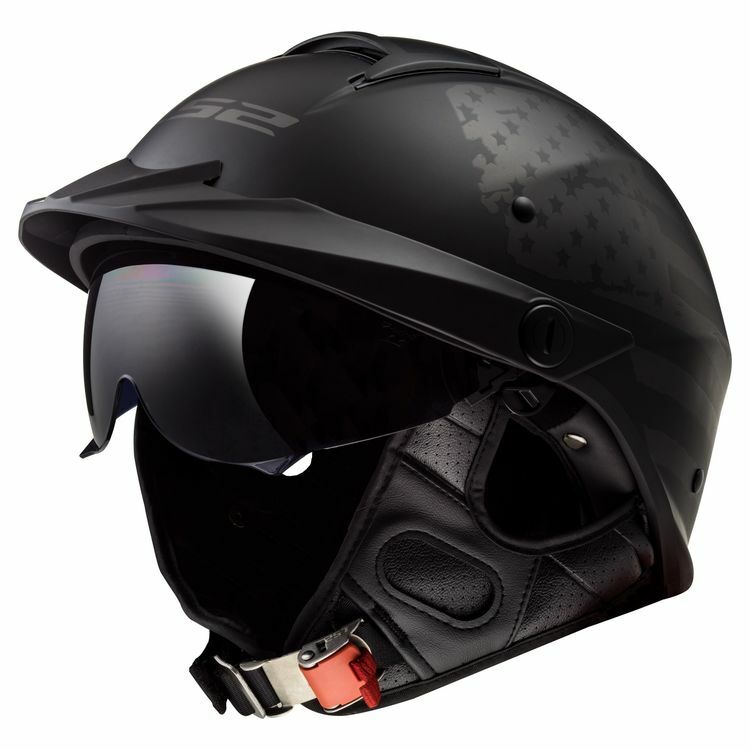 BEST ANSWER: It automatically comes dark shade, but you can order the clear when you choose the helmet. At least my great salesman gave me the option. It comes with a dark shade, so I ordered the clear visor which is interchangeable. Very happy with the result. Comes dark, you can purchase multiple variations of lenses from LS2. BEST ANSWER: Not really adjustable, it's either closed or open, but there is an option. No, it is open or close. This is still a great feature on a 1/2 helmet. you have to have open or closed there is no in between. Does the helmet come with a bag to store in it? BEST ANSWER: Yes, forgot to add that, wish it would've come with a skull cover. Does the sun shade have a mid position or can it only be fully open or fully closed? BEST ANSWER: Fully open or closed, depending on your head shape it may not come far enough down to cover your glasses. I have a small head, it just covers enough. Only fully open or fully closed.